Last week I worked up a sketch of the hosts of my favorite podcast. The Pretty Good Podcast. 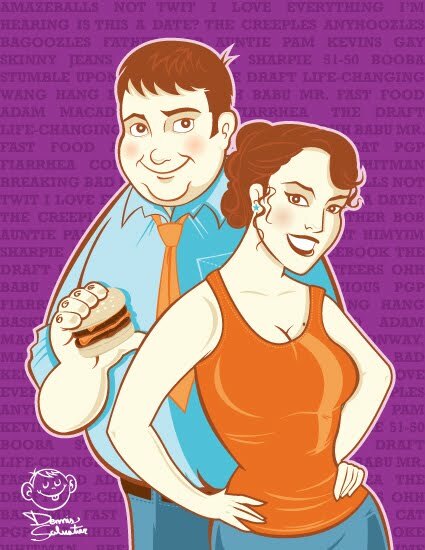 Gina and Randy are depicited here in full cartoony goodness. Check out the last post and see if you can find the small differences. So after the weekend I made a few final changes and think it's ready to go to print as a full blown poster for Gina and Randy. I hope they like it. Randy recently decided he wanted to stop eating all the crappy fast food we've come to know him for, so I let out a big d'oh! when I heard the show, but regardless of his healthy choices to come, this is the way he will always be remembered, so what the heck, right? Wow there really gonna love it. I like the color choices you made. Hey thanks guys. Make sure to check out the show. I think you'll enjoy it.